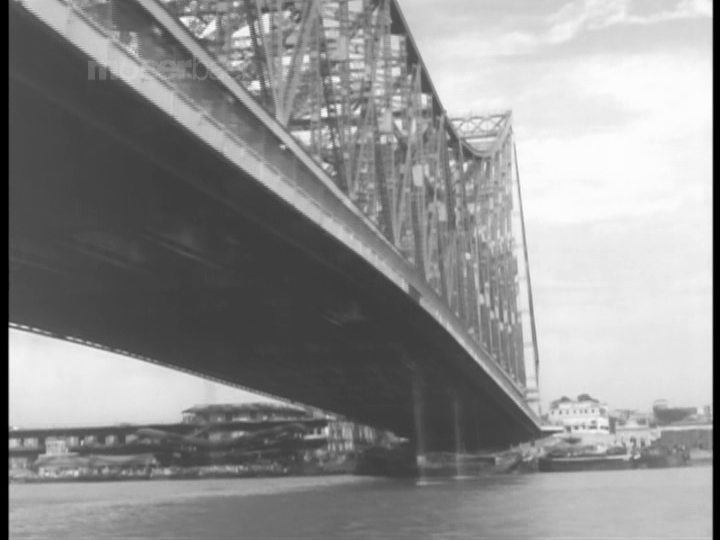 The only thing I knew about Howrah Bridge was that it featured Helen’s famous item number Mera Naam Chin Chin Chu, and that was the reason I picked it up in a collection of classic Black and White films. 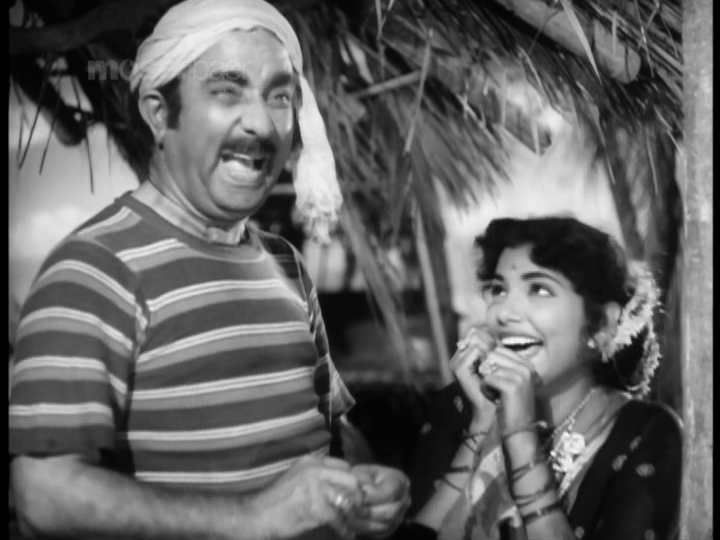 Although Helen’s appearance is a highlight, there is plenty more to enjoy, including great performances by Madhubala, Ashok Kumar and Om Prakash as well as some beautiful songs featuring Asha Bhosle and Mohammad Rafi. The story moves along at a steady pace without any unnecessary diversions from the main plot and despite knowing ‘whodunit’ from the opening scenes there is still intrigue and anticipation as events don’t unfold quite as expected. 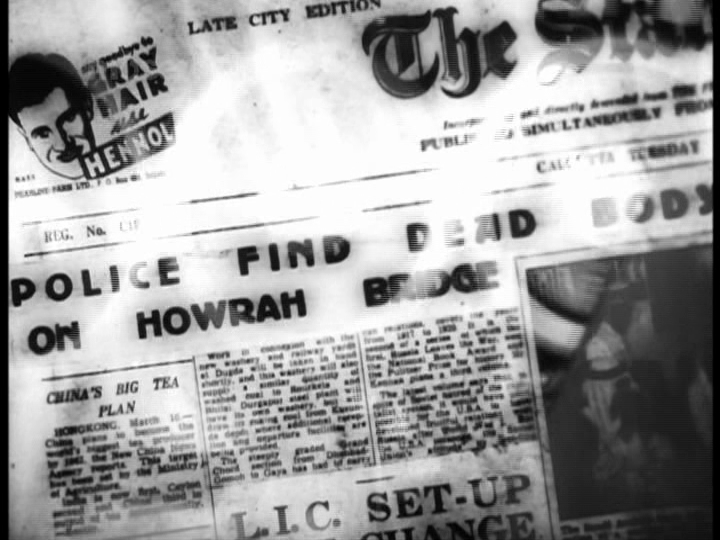 Howrah Bridge is an Indian take on film noir, although the story is perhaps not as dark and the characters less ambiguous than in the classic American films of the forties and fifties. However it follows the basic path of a crime drama with a leading lady of somewhat questionable background, and a villain who happily disposes of anyone who stands between him and his fortune. 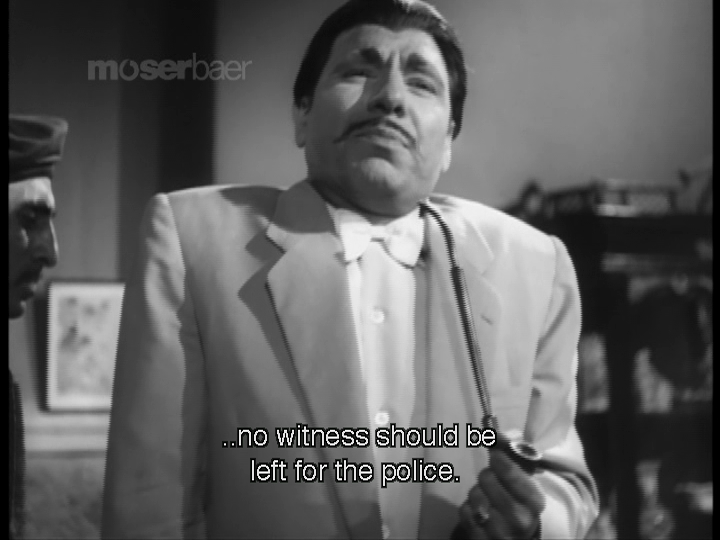 The lighting is generally subdued in film noir style and director Shakti Samanta makes excellent use of shadows to highlight the more dramatic moments in the film. 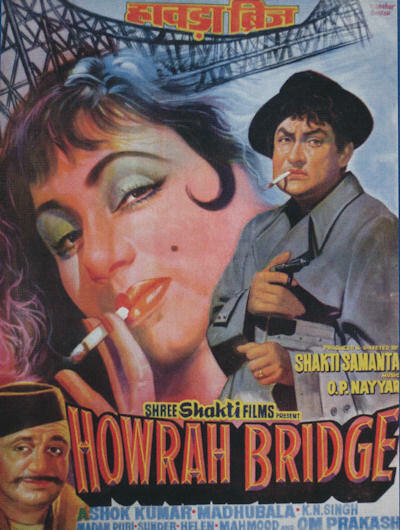 While most of the action takes place in a number of seedy hotels and dimly lit streets in Calcutta, Howrah Bridge appears from time to time and looms effectively over the characters as well as providing the location for the climax chase. The film starts with the theft of an heirloom from Prem Kumar’s family in Rangoon. 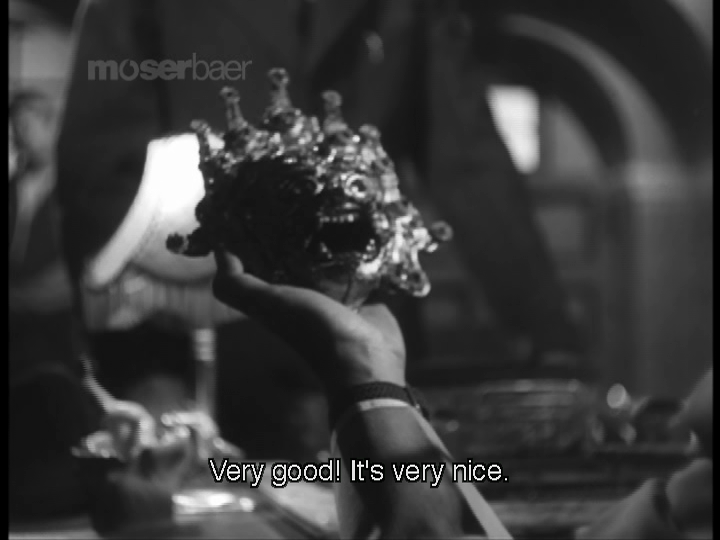 It turns out that the jewel encrusted dragon mask has been stolen by eldest son Madan (Chaman Puri), who has taken it to Calcutta to sell to the villainous Mr Chang (Madan Puri). Mr Chang wants the dragon but doesn’t want to pay for it, so he arranges for his chief henchman Pyarelal (K.N. Singh) to dispose of Madan and steal the dragon. Hearing of his brother’s murder, Prem Kumar (Ashok Kumar) heads to Calcutta to try to recover his family heirloom and en route he meets up with Uncle Joe (Dhumal) and his beautiful niece Edna (Madhubala) who sings and dances in Joe’s hotel. 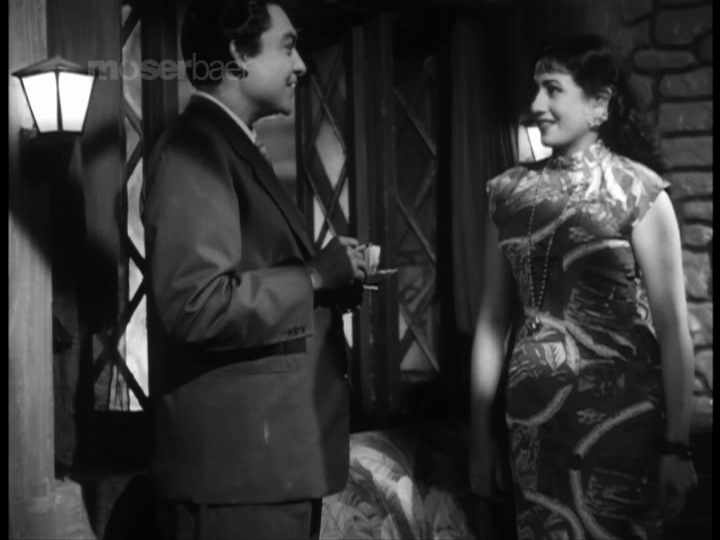 Prem is dismissive of Edna and her dancing while she is piqued by his resistance to her charms which gives her at least one reason to pursue Prem when she meets him again in Calcutta. Prem hooks up with Tangewala and old employee Shyamu (Om Prakash) and together they attempt to unravel the mystery surrounding Madan’s death and the disappearance of the dragon mask. This involves Prem assuming the name of Rakesh and following in his brother’s footsteps on the night of his murder while Shyamu uses the opportunity to get commissions from as many people as possible along the way. Added in to the mix of characters are Shyamu’s opium smoking nephew Bhiku who saw the murderers on Howrah Bridge, and his cheerful fiancée Chhamia who add some more conventional Bollywood drama to the story. I always love shots of newspapers and did pause to read the other headlines and the ads! 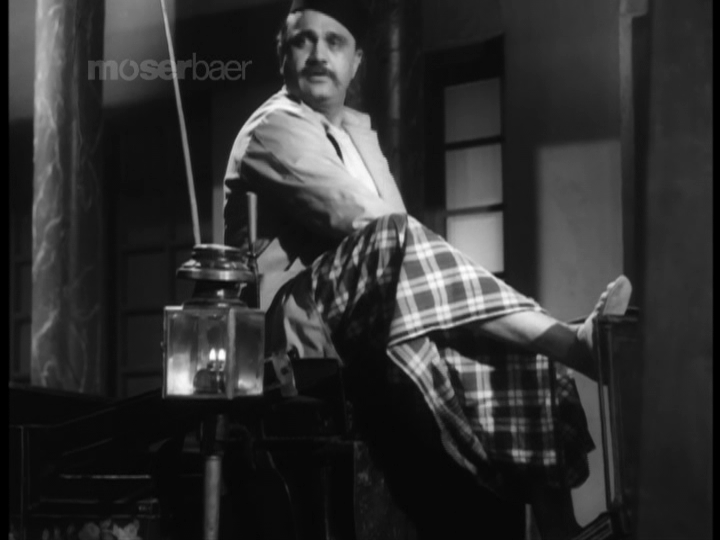 Madhubala plays the role of an Anglo-Indian, perhaps to explain her Western style clothing and account for her less than respectable position as a singer and dancer in her Uncle’s hotel. While she doesn’t do very much dancing, she is convincing as a singer doing her best to entertain the crowd and attract the attention of Prem. She looks beautiful in swishy skirts and Chinese tunics, and gives Edna charm and vulnerability despite her profession and unsavoury connections to the local criminals. Some of the noir element creeps in here as Edna obviously knows about the various shady deals going on between Uncle Joe and Mr Chang. Her attempts to lure Prem to the hotel seem initially to be to expose him to some theft or extortion attempt perhaps in revenge for his previous treatment of her. 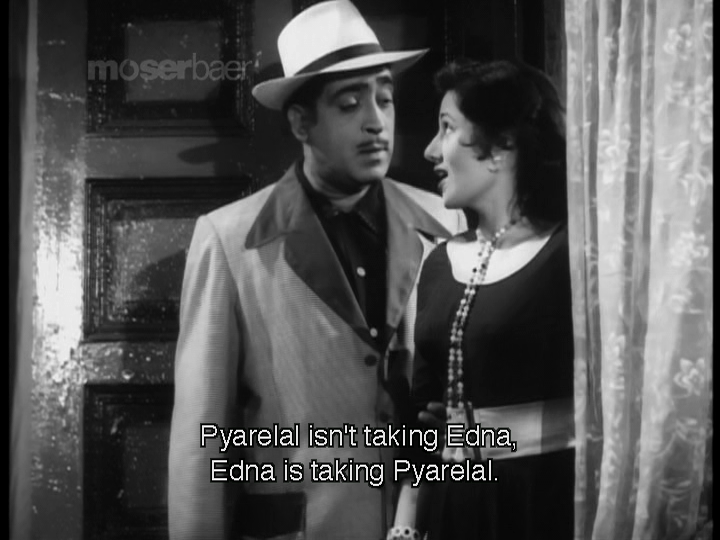 Prem is also less than honest as he encourages Edna’s advances to learn more about the smuggling gang run by Mr Chang and Pyarelal. But that’s about it for any noir-ish character ambiguity and rather quickly a real and genuine attraction forms between the two. After a few cups of tea and a boat trip on the river (a Bollywood staple always guaranteed to result in romance) Edna confesses her love for Prem. While Prem does take a little longer to declare his love, the relationship feels warm and affectionate with excellent chemistry between the two actors. 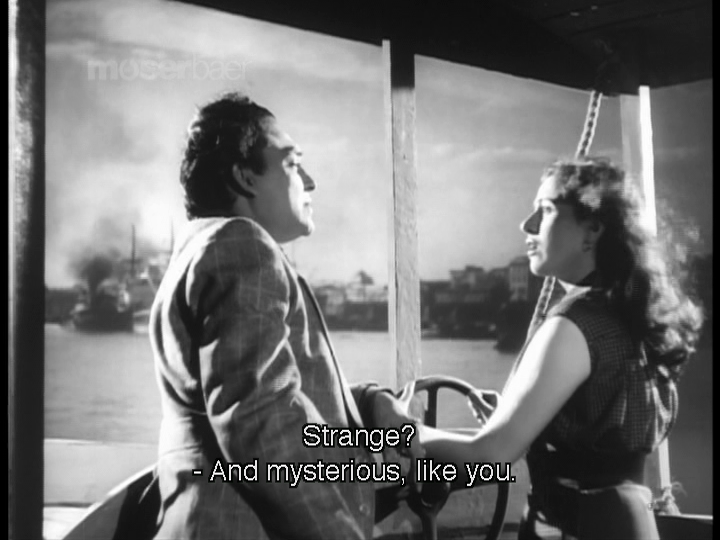 Ashok Kumar is always a very competent actor and here he shows his romantic side while Madhubala looks gorgeous and seems to relish her role as Edna turns sleuth and starts to help Prem with his investigation. The other characters all fit their parts well. Madan Puri’s Mr Chang is an interesting villain and somewhat different from the usual swaggering, self-confident bully seen in most Bollywood films. He has a limp and walks with a cane, demonstrates a number of affected mannerisms and speaks Hindi softly in a high-pitched voice with a touch of an accent to accentuate his Chinese origin. Chang demonstrates a cold and callous nature when he casually orders the deaths of various lackeys he feels may be a threat but becomes agitated and afraid when he knows that the cops are on his trail. It’s an excellent portrayal and provides a good contrast to K.N. Singh as Pyarelal who plays his role as a more conventional gangster very competently. The oriental touches suit the overall look of the film and of course Helen is perfect (and looks so very young and totally stunning too) as the wonderful Chin Chin Chu when she dances in Mr Chang’s hotel. 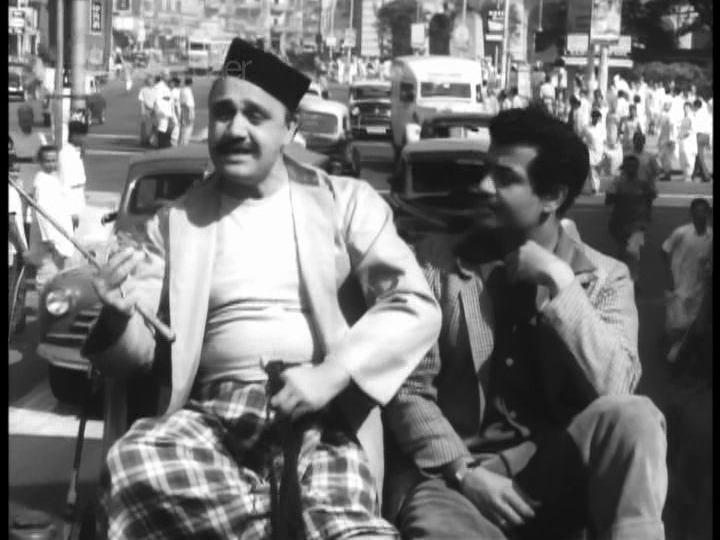 The music by O.P Nayyar fits the feel of the film perfectly and ranges from romantic duets to a very jaunty song Shyamu sings as he drives through Calcutta. Mehmood and his sister Minoo Mumtaz also pop up in a fun song at a wedding where Mehmood indulges in some excellent uncle dancing. I really enjoyed Howrah Bridge and wasn’t surprised to find that it was directed by one of my favourite directors from this era. 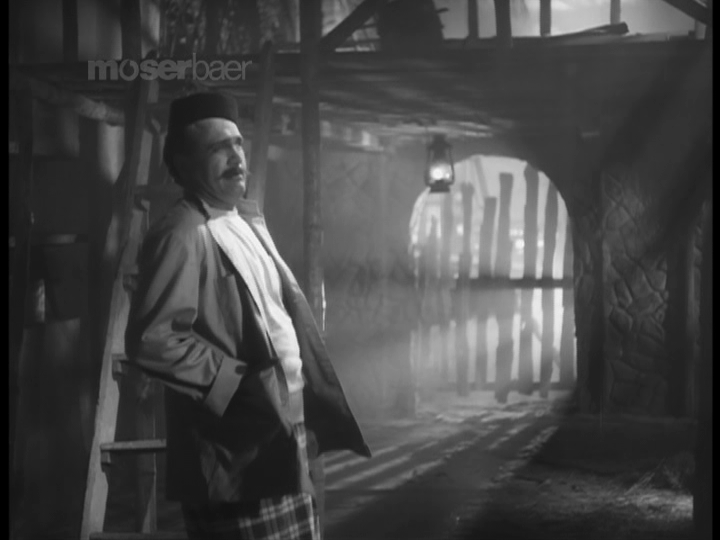 I liked the touches of film noir and the variation between light and shade in Chandu’s cinematography, although it’s possible some of the dim lighting may just be due to some deterioration in the film with age. 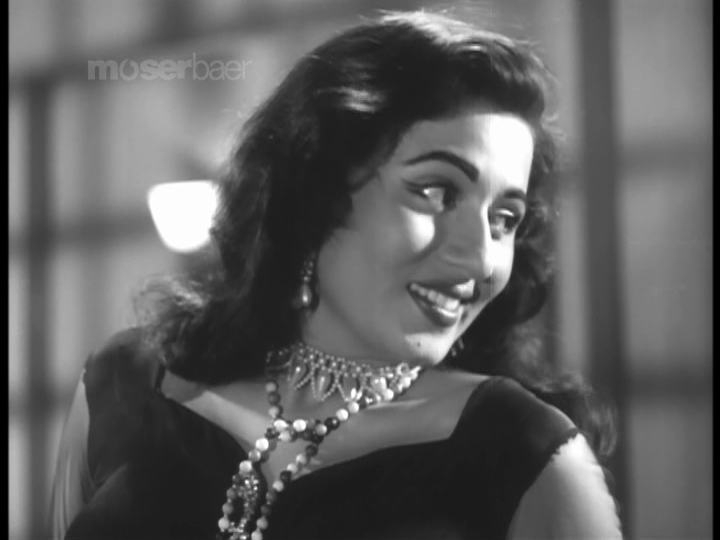 Madhubala is always a pleasure to see in any film and she tends to steal the show whenever she appears. While Ashok Kumar is an actor I enjoy watching, he really does suit this type of role and I think this made me appreciate his performance rather more than usual. I was a little disappointed that despite secret doors and an intricate hiding place for his safe, Mr Chang didn’t have a suitably villainous lair, but the dimly lit room with its statues and heavy furniture was probably more in keeping with his character. It’s not the most exciting story but with excellent performances by some of the most renowned actors of the day, it’s a film worth watching for more than just Helen’s fab appearance. I give Howrah Bridge 4 stars. 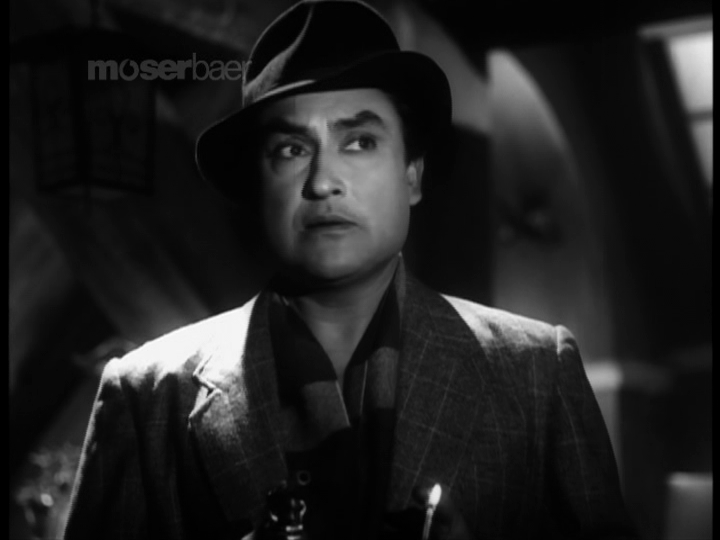 I am a huge admirer of Ashok Kumar and have been gradually working my way through his filmography. Of course, Helen in any appearance also pushes a film up the to-be-watched pile. 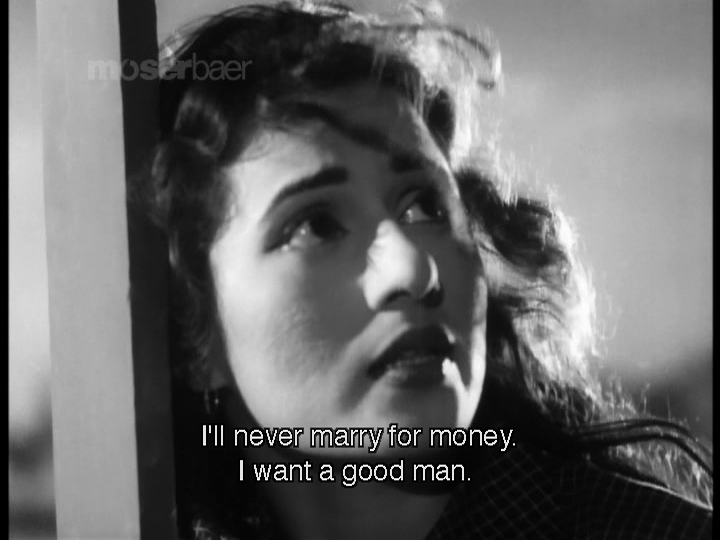 And I’d watch Madhubala if she was watching paint dry so I had high hopes when I first watched this. Sadly, the stars and the songs are really the only highlights for me. Ashok Kumar and Madhubala have a delightful chemistry and their scenes together crackle with life and are full of emotion. Unfortunately the story is not particularly interesting as it is obvious what will happen and who will do what. The pace is leisurely at best, and there is just not enough tension as things plod along so my attention kept skipping to what I knew was going to happen down the track. I found the villains characterisations particularly unimpressive and they lacked purpose – they were just generic bad guys and the addition of all the silly mannerisms did nothing to make Chang more credible or threatening. I do like a lot of the supporting cast, especially Om Prakash, but they generally aren’t doing enough in terms of the story to hold my interest. 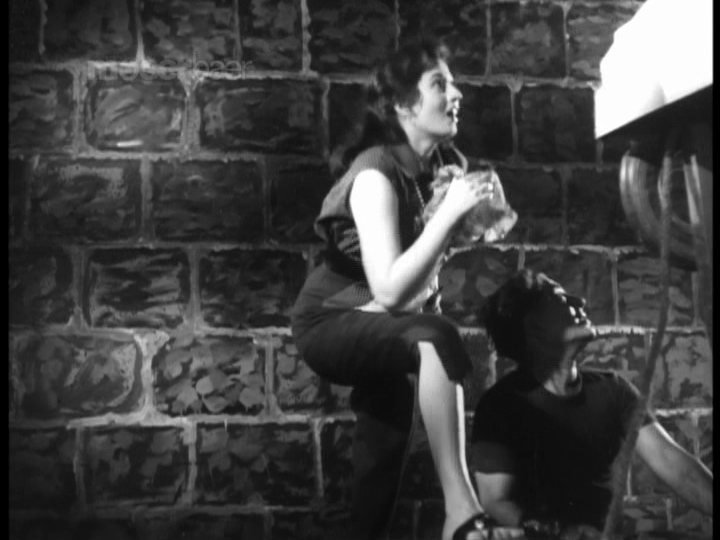 The songs are excellent, and Madhubala can certainly work the camera! I watched the movie again last week and I found it quite dull. Unless Ashok or Madhubala was on screen, preferably both, or it was one of the fabulous songs I was itching for the fast forward. I am happy I have seen it as it is often referenced as a classic of its era, but it’s not a favourite for me and I think it is just an OK film. I would recommend or rewatch a number of other films released around the same time – for instance the thriller 12 O’Clock, Madhumati or for a change of pace, Chalti Ka Naam Gaadi – over this. 3 stars. This entry was posted in Bollywood and tagged Asha Bhosle, Ashok Kumar, Chaman Puri, Chandu, Dhumal, Geeta Dutt, Helen, Hindi, Howrah Bridge, K.N. Singh, Kammo, Madan Puri, Madhubala, Mehmood, Minoo Mumtaz, Mohammed Rafi, Mohd Rafi, O.P. Nayyar, Om Prakash, Ranjan Bose, Shakti Samanta, Sunder. Bookmark the permalink. I like Howrah Bridge for the Calcutta ambiance and Ashok and Madhubala especially. They make a great romantic pairing. Have you seen Ek Saal? It has its issues, but it’s so much fun to watch them together. I haven’t actually seen Ek Saal – I will have to track down a copy 🙂 Thanks for the recommendation.